For a short period during 1945, the sure-fire comedy team of Abbott and Costello suffered in battle, though it was very much internal ‘friendly fire’ combat between them that temporarily broke up the act. 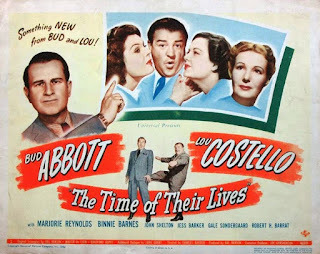 The result of this was a two-film spell where the boys appeared as separate characters rather than a duo, firstly in the relative failure Little Giant filmed at the end of 1945, and then more markedly in the romantic fantasy comedy The Time of Their Lives (1946). Fans not knowing their earlier work could be forgiven for thinking that this film was their introduction to each other, the division between them is so pronounced (they only interact with one another at the start as rival lovers). Happily their dispute caused no harm to what turned out to be one of their best comedies. The script by Walter DeLeon, Val Burton and Bradford Ropes (augmented by their resident gagsmith John Grant) eschews all the usual Burlesque routines, by necessity, and drives along a more seriously-pursued plot than usual but is still funny. The circumstances arguably injected a freshness into audiences’ expectations of the team: Lou is given a charming temporary new female partner to bounce off, whilst Bud demonstrates his skills as a straight actor in what is almost a leading man role. The setting is King’s Point in America’s New England during 1780, five years into the War of Independence. Tom Danbury (Jess Parker) is the wealthy owner of a family estate whose staff include Abbott as his butler Cuthbert Greenway, a dark schemer who will stop at nothing to marry housemaid Nora O’Leary (Anne Gillis). His rival for her affections is a travelling master tinker Horatio Prim - Costello in lovable child-man mode. 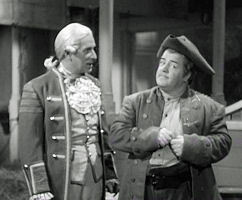 Horatio proudly bears a letter of recommendation from General George Washington that he hopes will impress Danbury enough to release Nora from servitude to marry him. (This letter will become a focal point of the movie’s plot). At this news, Greenway leaves nothing to chance and removes his competition by locking Prim in a trunk. Danbury meanwhile is even more corrupt: a secret British loyalist, he holds secret meetings to betray his countrymen. Nora is caught eavesdropping by him, so Danbury hides Prim’s letter he gave her and conceals it in a clock. 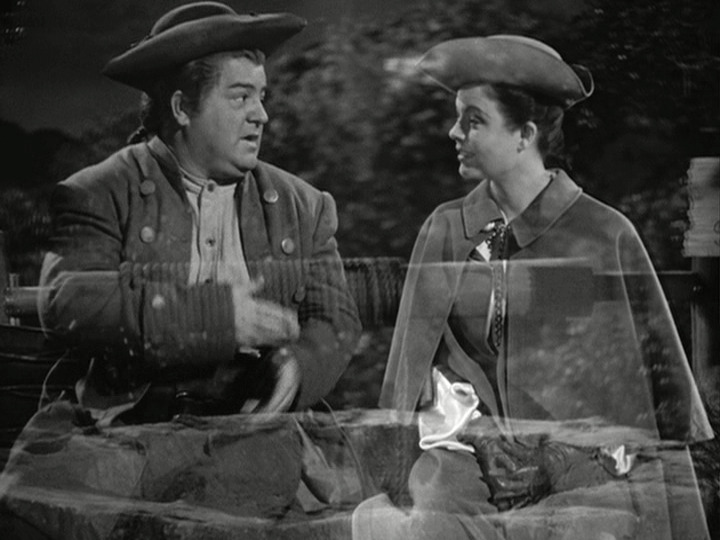 Tom’s own fiancé Melody Allen (Marjorie Reynolds) is about to ride off to alert the rebel forces with the newly-escaped Horatio when arriving British soldiers shoot them in error. The poor dead pair are dumped down a well, leaving the officer to curse their presumed treacherous souls to an eternity bound to the property “till crack of doom” unless proof of their innocence can be found. And so they must stay as spectral prisoners until 1946 – a passage of time charmingly rendered by lovers’ initials carved into love-hearts on the estate trees across the decades. 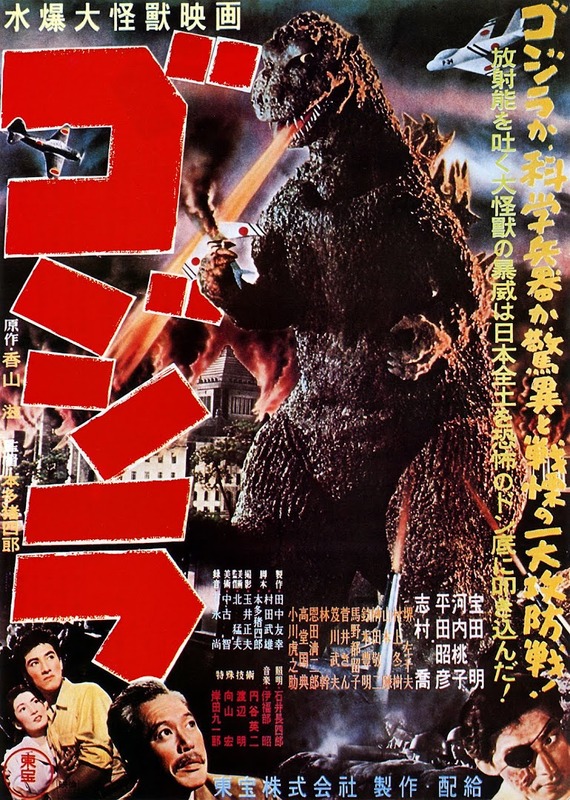 Director Charles Barton, in the first of eight films he directed for Bud and Lou, ensures this first act of the story moves at a decent pace, which is just as well since it has to set up quite a congested storyline through till the modern day. The lace and periwigged costumes for the cast are handsomely produced by Rosemary Odell, and Milton Rosen’s fanciful music score adds a welcome lightness. 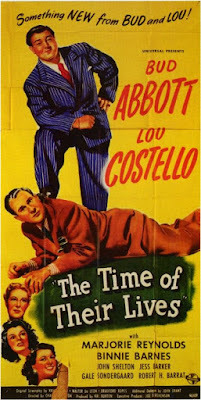 In terms of the boys’ established characters, Costello benefits greatly from the luscious warmth of his partner Reynolds, at times softening his usually frenetic style so as not to overshadow her. They make a beguiling double-act, teasing each other like an elder sister and younger brother. Melody schools Horatio in the finer points of disappearing and teleportation for example, allowing him the space to still be the wheezing, lily-livered innocent exclaiming “Odds bodkins!” and other archaic phrases of wonderment. Abbott channels the alpha-male persona he would normally use to dominate Costello into making Greenway an unsympathetic ancestral bully so that his twentieth-century descendant, Dr Ralph Greenway, has a legacy to atone for. Here, he is so effective as an urbane, white-collar psychiatrist targeted by the taunting Horatio that one can easily imagine he’d have made a credible straight contract player for Universal had comedy not panned out. Abbott plays his role commendably straight, only straying into eye-popping broad comic reactions when called upon to react to floating matches, decanters etc that Horatio invisibly uses to frustrate him. The Forties Danbury household contains sight-gag potential galore for Melody and Horatio to explore the modern age marvels of electric light, telephones and radios. The new owners Sheldon Gage and his fiancé June Prescott (John Shelton and Lynn Baggett) also employ Gale Sondergaard’s Emily, who seems at first the archetypal frosty housekeeper she had portrayed in horror films so many times before – as in The Cat and the Canary (1939) and The Black Cat (1941). Here though, rather than simply a harbinger of doom, she is a psychic in sympathy with the restless phantoms, determined to enlist the house in helping them seek eternal rest. She even gets a possible sly in-joke as she exits a scene - “All you gotta do is whistle” – referencing Lauren Bacall’s bewitching come-on to Humphrey Bogart in 1944’s To Have and Have Not. More blatant wise-cracking is supplied by June's Aunt Millie played by Binnie Barnes, an actress who lived to be ninety-five and prided herself on never accepting subservient parts. Eventually a séance is held whereby the unseen Melody and Horatio communicate enough via prompted table-knocks to set the household on the hunt for the all-important exonerating letter, aided by Emily becoming a conduit for the spirit of Tom Danbury to voice a cryptic rhyme of clues. 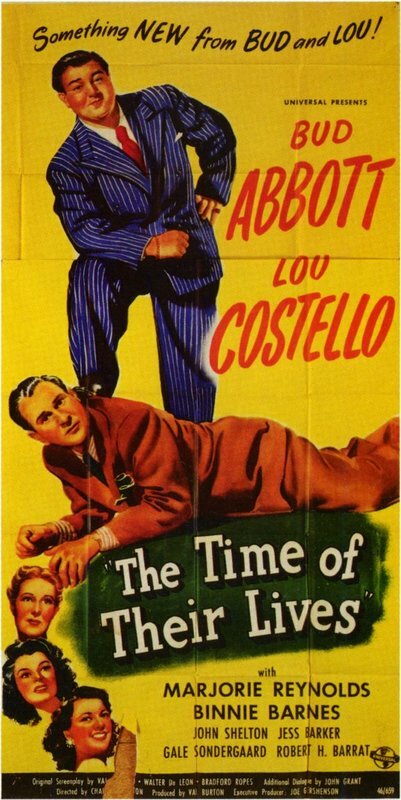 Greenway’s theft of a Queen Anne clock from a museum causes a climactic broad comedy car-chase, one concession made to Bud and Lou’s regular slapstick territory, between Horatio and a beleaguered Police Sergeant (William Hall). Finally, the document is found and enables the movie to end in an upbeat glimpse of the afterlife (even more rosily depicted later that year in A Matter of Life and Death) as Melody is restored in a stream of astral glitter to Tom but Horatio is temporarily blocked from Nora at the Pearly Gates by its closure for Washington’s birthday!